I am sure it could be an interesting topic.Really I do not have many Slovak awards from this period in my collection,but many of them have gone through my fingers,and they will go through too.There are not many collectors of the awards of this period.There are many reasons.If somebody is interested why I will explain.First I will show some I have got the snaps I left.Later I will have to do some more pictures.Have a good fun having a look at them. 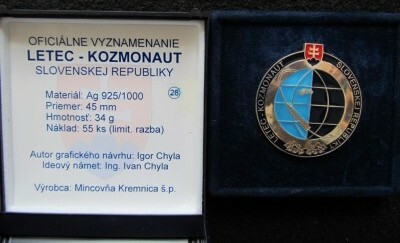 1.The Bagde Pilot -Cosmonaut of the Slovak Republic.The badge was created because of opportunity of the flight of the first Slovak cosmonaut Ivan Bella in 2000.Obverse-the spaceship around the globe,in the middle with the territory of the Slovak Republic.Around the bagde is written-The Pilot-Cosmonaut of the Slovak Republic.Material is silver,marked at the reverse.Screwback.In nice etue,with the certificate inside.50 badges were awarded,e.g.n. 1-Ivan Bella,n.2-reserve cosmonaut -Fuljer,,n.3-the President of the country...etc.The slovak language took the using of russian word,not american one-astronaut.so the Cosmonaut,not Astronaut. I have got the badge with number 28 in my collection.I had 3 of them ,but they had been sold. It was awarded for representing of the good name of the state and for the certain merit. 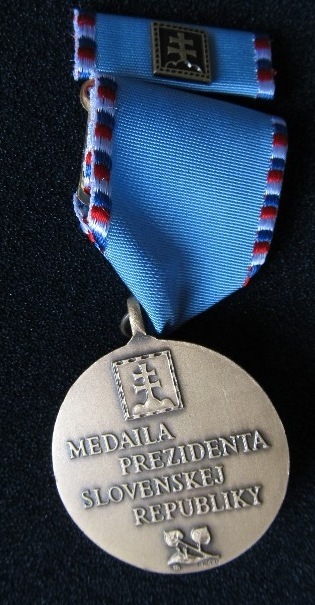 Its diameter is 35mm.Made from bronze.In the obverse we can see the silhouette -online of the Bratislava Castle and Martin Dome.In the revese the signature The Medal of the President of the Slovak Republic with the state sign.The award came into being in 2001 on the proposal of R.Schuster,the 2 President of Slovakia.Also I had in my collection the 1st and 2nd grades.Now they are away in the collections of other collectors. I am sorry for the deleting of the name in the certificate. At present time a new design of the award is used.Apologise for not showing it.Simply, I do not have it in my collection. 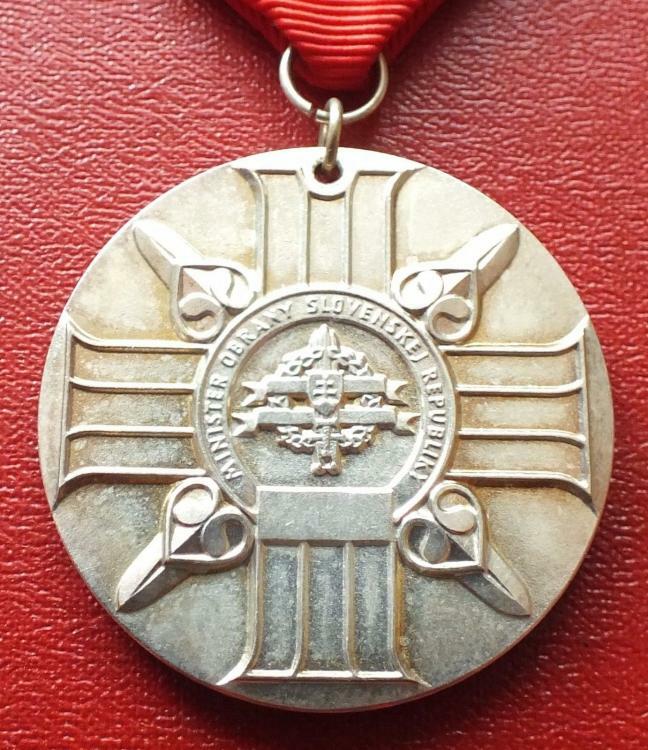 The medal was established in 1998 mostly for military percons to appreciate them for merits in the defence of the state and widespreading of its good name. It is in 3 classes.In the picture I am showing is the medal of the 1st class.In silver,gilted. 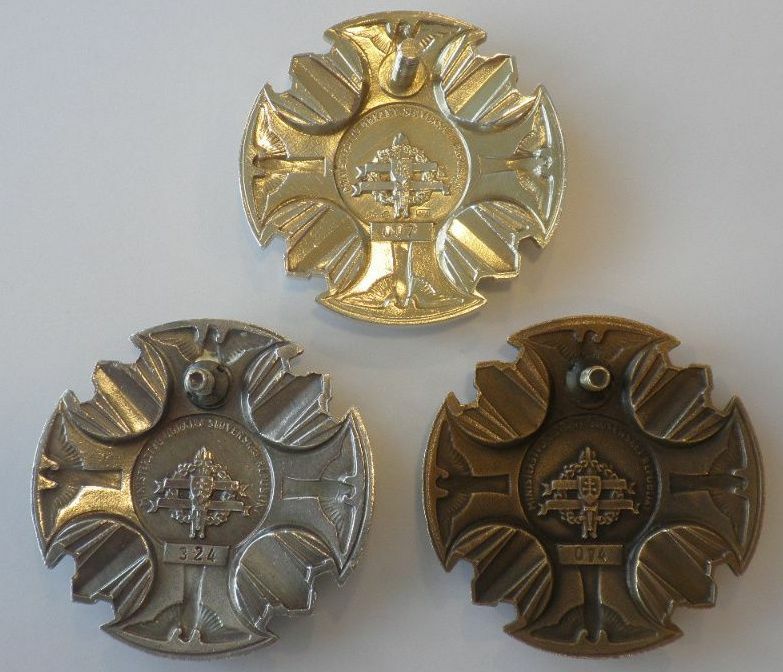 The medal in the 2nd class is from bronze -silvered. The medal in the 3rd class is from bronze. 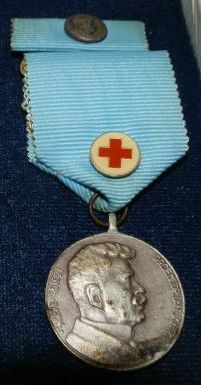 The diameter of the medal is 40 mm. 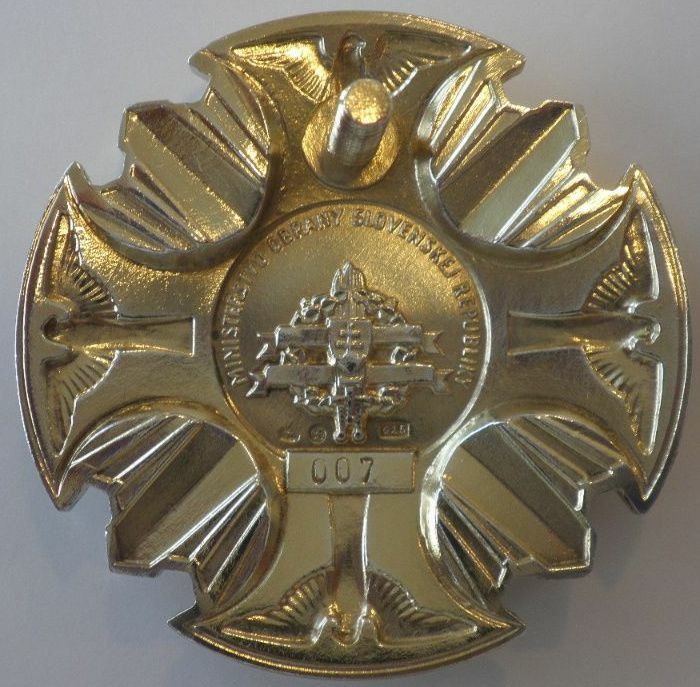 It was established in 2004 to award mainly military persons for their work in peace missions or for help in developing countries after natural calamities or other disasters.It is very rare,but the design is simple.It is not interesting for collectors.Only me and Ed Emering have it,I suppose. Made from white metal ,diameter 36mm. Reverse-a logo of Ministry of Defence of Slovakia. 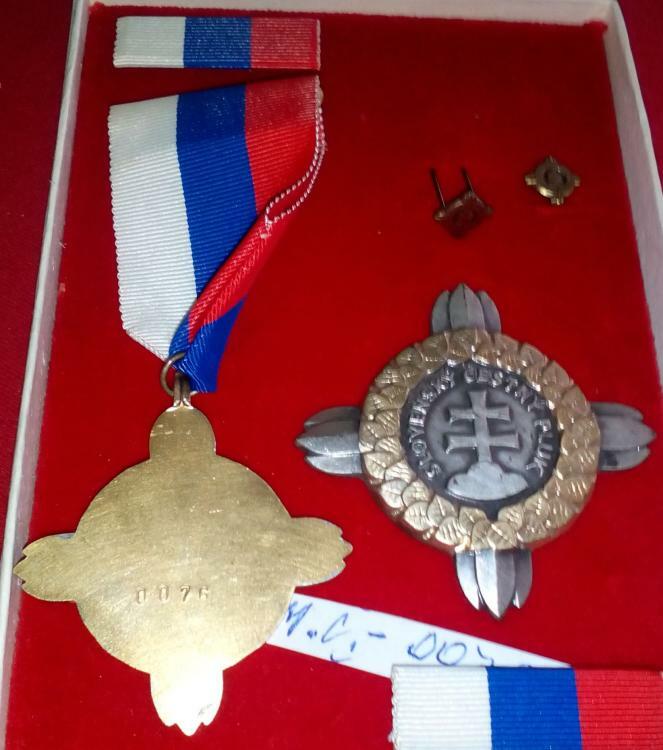 The Award For Merit in Slovak Prison Guards.Is is from white metal,diameter-36mm,in the picture is the 1st grade.The award looks like a flower. 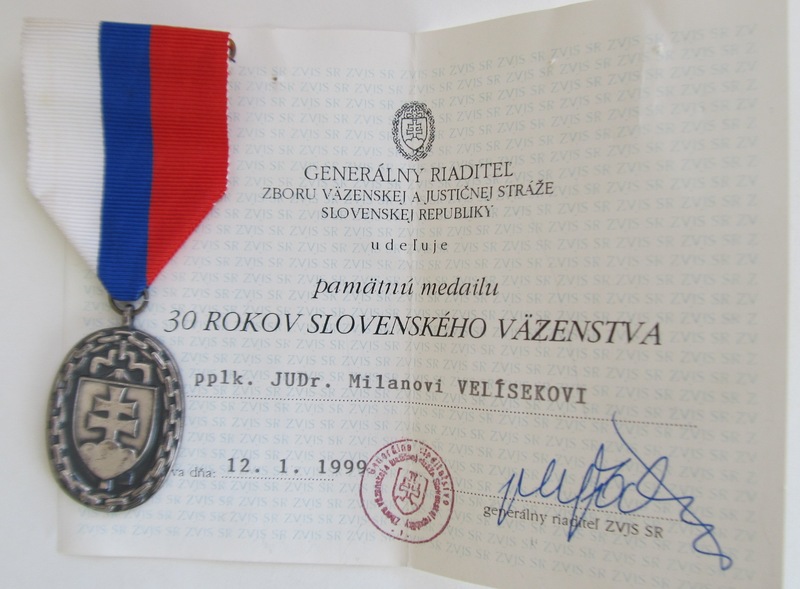 The next one in the pictures is 30 years of Slovak Prison Guards.The medals are in silver and white metal.Dimension 28X36mm. In the 3rd picture are the reverses of both together. Medal is 26 mm in diameter .Made from bronze ,sivered,gilted. 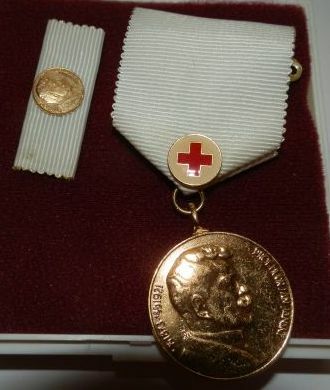 I have not got the picture of the Platinum grade for 60 blood giving. There some more versions of this award.The reverse of the medal is plate. 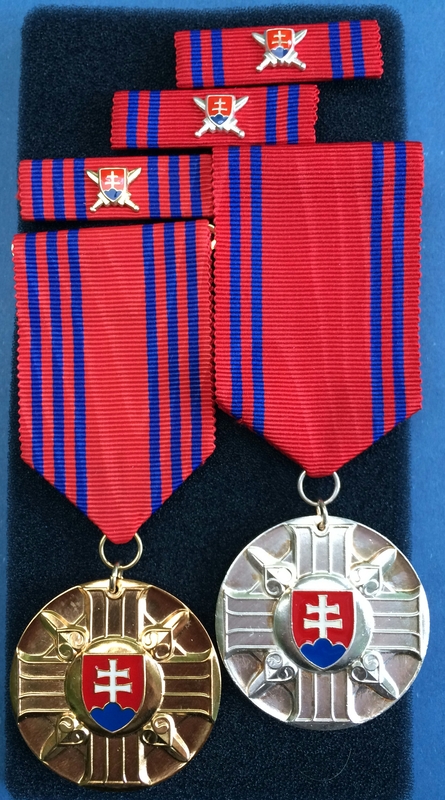 7.I am going to add the next picture of the 2nd and the 3 rd grades of the Commemorative Medal of the Minister of Defence of the Slovak Republic .The medals in the picture are together with the Honour Badges of the Army of the Slovak Republc.Badges are in 3 classes and are given to soldiers of the army for responsiblle service.The 1st grade is in gilted silver.The images of the Honour Badge is the cross ended with falcons in the end of them. 8.The Cross for Adherance to the Army of the Slovak Republic.The award is in 3 grades.The 1st grade-for 15 years of the faithful service .The cross for 1st grade is in slver.The 2nd grade is for 10 years and the 3rd grade for 5 years of service.The dimensoin of award is 4 cm. 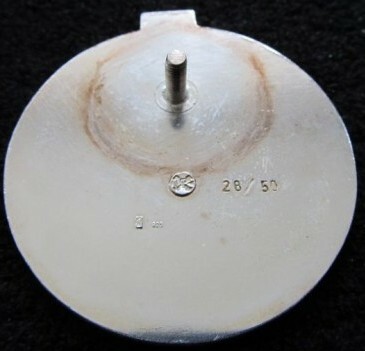 I understand, that so called Pilot -Cosmonaut badge is not an official badge but a privately made badge to make profit. Can you clarify? I am very familiar with the author of the badge,simply -we are good friends.We have known each other more than 40 years.I was talking with him about this badge many times.There was no reason and sense to make only 2 badges for Ivan Bella and the reserve cosmonaut,so 55 badges were made.50 of them were awarded ,5 of them were so called Authors Exemplars.Authors exemplars were sold to Chylas friends.He was offering me one, too,17 years ago.He wanted 10 000 krones,but I did not take it.Mine was bought by me in 2004.I exchanged it.The badge die was destroyed after all. Sometimes these badges are for sale,as other awards.Relatives sell many awards,if they do not do it,there are no collectors. The badge is an award,it si not made to sell it as a souvenir.I think it will be difficult to have it with number 1/50,which was awarded to Ivan Bella.In my opinion ,there is no difference to have badge numerred 1/50 or 28/50.Both of them deserve some place in collections. I would like to add the reverses of the Honour Badges.I took them in internet. Interesting item. About the Commemorative medal of the Minister of Defence, can you tell me something about the numbering on the reverse. I received a third class in 2009 and always wondered if the numbering started with number 1 in 1998. In 2009 the number of the 3rd class was around 3700. 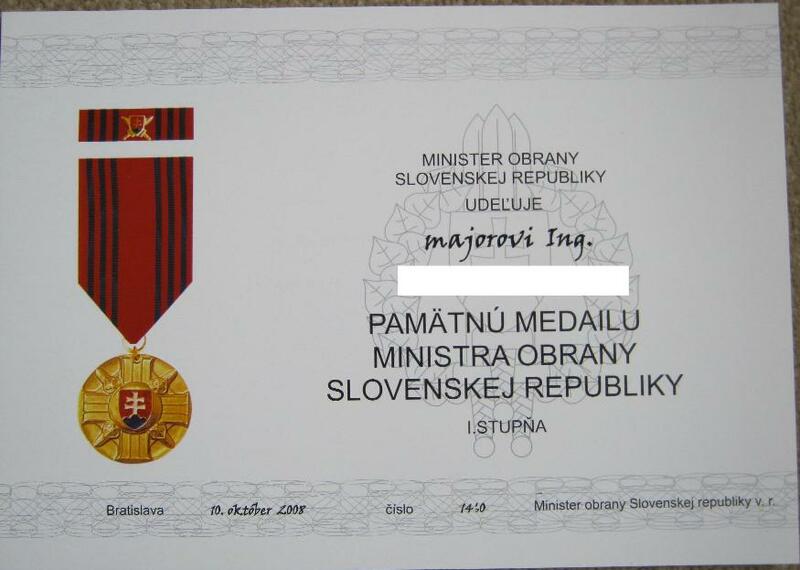 Does your country have miniatures for their Slovak orders, decorations and medals? Are the medals traceable by it's number? How about this unnumbered specimen below? I am very interested in the history of this medal? Herman,I would like to answer to your questins,but I am not such a big expert.First, I have seen only numberred exemplars,I have not seen the unnumerred ones.The medals I placed into topic are from my collection and they have miniatures.I bought some though,I really do not collect these awards,I have ony 4 of them,I do not count the Jubilee awards of Slovak Union of Antifascists.I have only one state award-Medal of the President 1st version.It is not easy to collect present Slovak awards,because the people who received them are alive,though I am familiar with some collectors who have all present orders in their collections ,for example,but they live in Bratislava where is the simplest way to get awards. 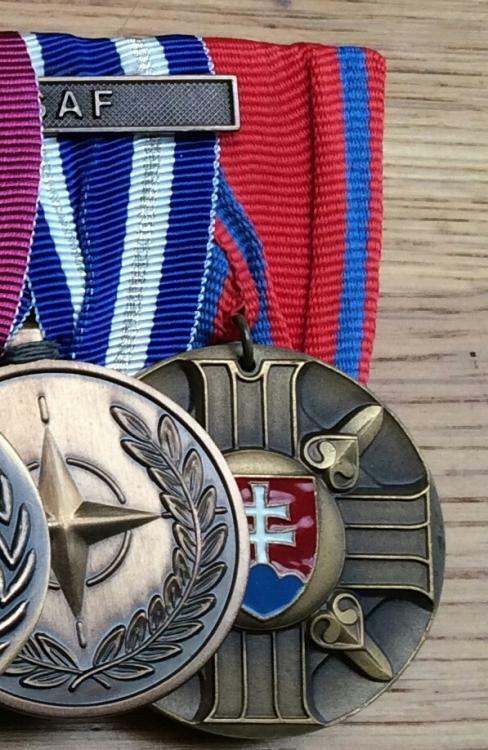 I am not able to explain why the medal in the picture does not have any number. Nick, thanks for the reply. I will add some more pictures of the Commemorative medal of the Minister of Defence as that medal is the focus of my Slowak interest. The first picture is of a gilded silver 1st class and a silvered bronze 2nd class. 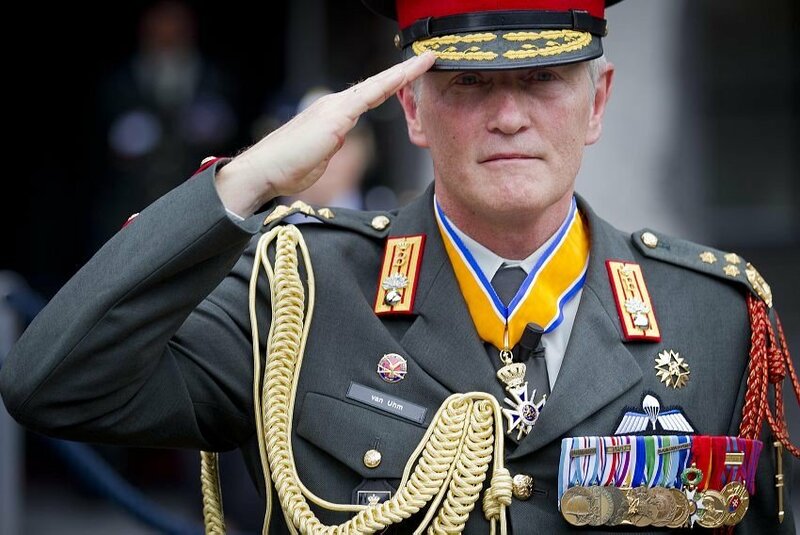 The ribbon bar is of Dutch General Peter van Uhm who was Commander of the Dutch Forces from 2008 to 2012 and received a 1st class from your country. His uniform is in a museum now. Nick, do you have any idea who manufactured these medals? There is a makers mark on the back of the golden first class. Herman,of course Kremnica Mint.And what about the putting the nice bar into topic? Yes,it is.Are there any Dutch orders? How about this Dutch group. 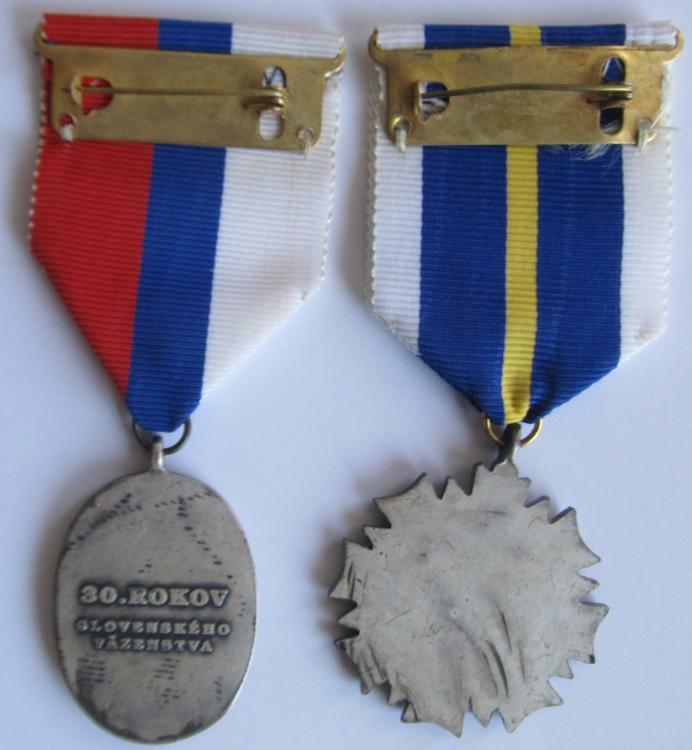 It has a Slovak campaign medal. Received in Uruzgan, Afghanistan in 2009. To put a face with the name. Meet General (Infantry) Peter van Uhm. This picture was taken at his retirement date. Herman,the upper bar has the Slovak medal For service in peacekeeping observers missions.It is the 2nd version of medal For service in peacekeeping missions.There are 6 classes of the medal. Probably 3 years ago I sold all these medals-2 versions. In the future I will put the example of the medal to this topic.Simply I do not want to steal pictures only from internet. Fascinating thread - finding out about these modern awards can be very difficult! 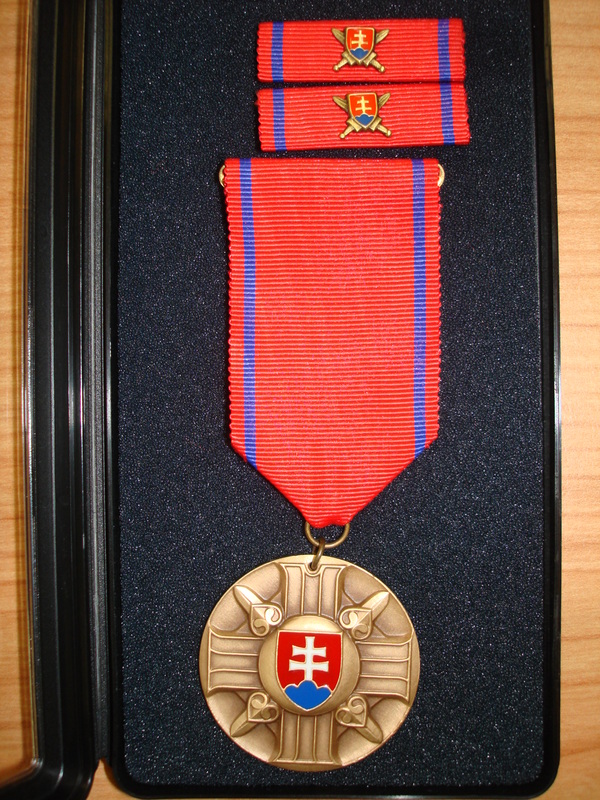 9.For service in peacekeeping missions -the 1 st version existed from 1994 to 2003.There were 6 grades of the medal.Diameter of the medal 4 cm,the width of the ribbon 3,8 cm,the reverse of the medal has the title Minister of Defence of the Slovak republic.Medals were made from white metal. Grades consisted not only in number of missions but also in bravery in the field and other merit. I am sorry but there was not any picture first.I hope it will be OK and the images will be uploaded. 10.For service in peacekeeping observers missions - this medals have been used since 2003.The pictures in the medals have been changed and the title-name of medals changed a little.The lentils with the numbers in the ribbons mean grades. 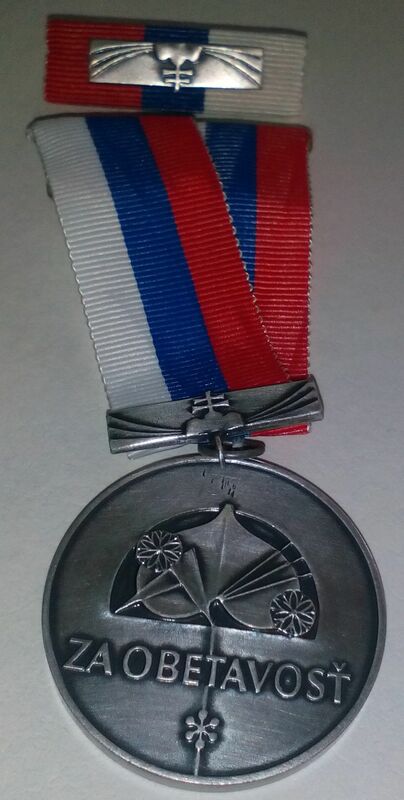 It has the design of a medal on ribbon.Medal looks like as a clover of 4 leaves.Date of Establishment-2007.I do not have much information for what merit it is awarded.It is made from white metal. 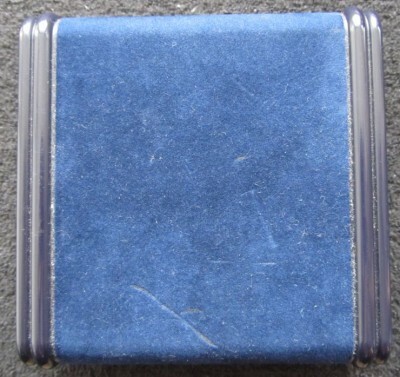 It was made for Association of Slovak soldiers.We know the grade on ribbon and screwback. Medal for Selfsacrifice-it is awarded to policemen but also firemen for heroic acts,help or saving people in danger,rescue of huge value. A nice example of the Commemorative medal of the Minister of Defence 3th class. 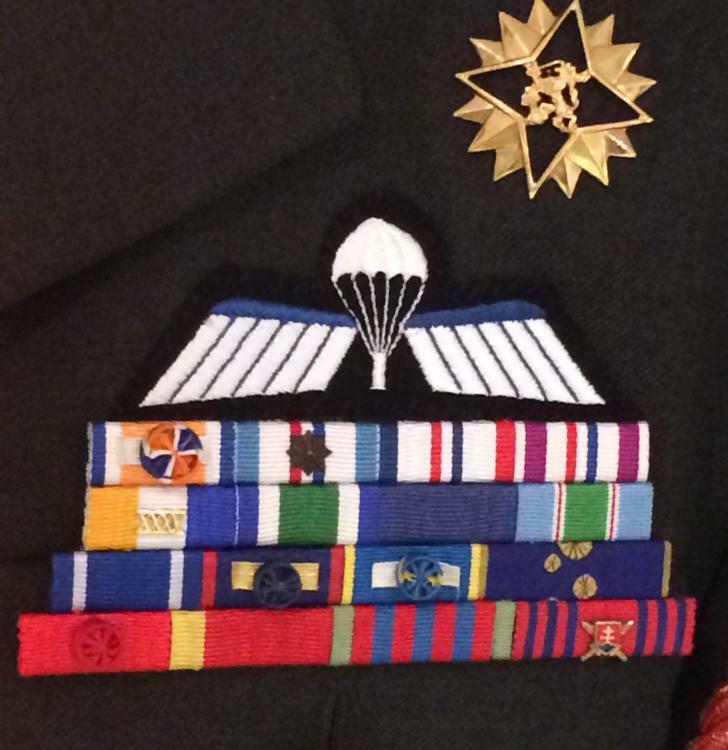 Herman, could you please show a photo of the whole medal bar? Thanks in advance.